M: Henry Clay Shepherd, Jr.
She married Henry Clay Shepherd, Jr., May 16 1970, Shiloh Presbyterian Church, Burlington, Alamance County, North Carolina.5,6 Henry, son of Henry Clay Shepherd, Sr..
REIDSVILLE - Karen Hinshaw Shreve, 54, of 673 Citty Store Road died Thursday, November 9, 2006 at Annie Penn Hospital. Mrs. Shreve was born in Alamance County to Theiron Hinshaw and the late Mabel Martin Hinshaw. She was a registered nurse and a member of Shiloh Presbyterian Church. She was also preceded in death by her sister, Judy Hinshaw. She is survived by her husband, Mark Shreve of the home; son, Nickolas Shepherd of Burlington; three grandchildren, Ian, Eliot and Ayden Shepherd. Condolences may be sent to www.wilkersonfuneral.com. 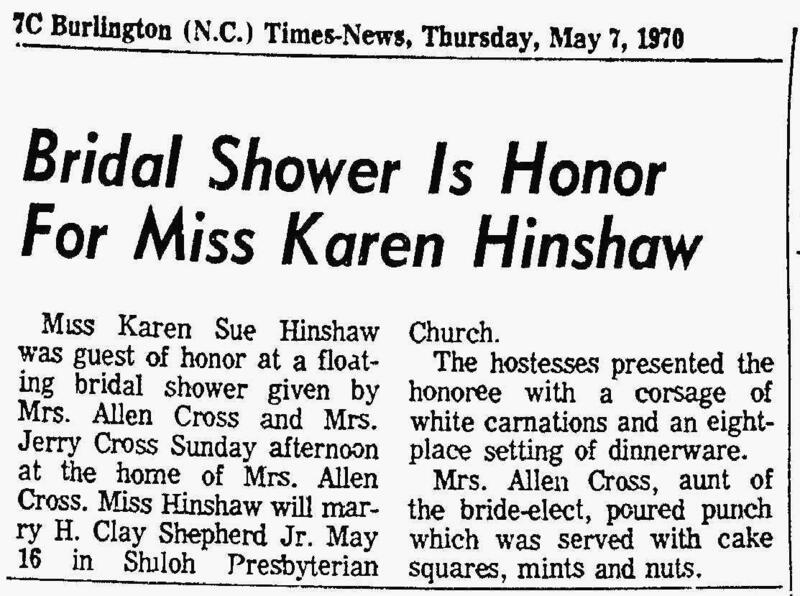 Karen Sue Hinshaw bridal shower; "The Daily Times News" (Burlington, North Carolina), May 7 1970; http://www.ancestry.com. Marriage of Karen Sue Hinshaw & Henry Clay Shepherd, Jr.; "The Daily Times News" (Burlington, North Carolina), May 22 1970; http://www.ancestry.com. "The Daily Times News" (Burlington, North Carolina), Oct 21 1970; http://www.ancestry.com. Obituary of Theiron Swaindell Hinshaw. Obituary of Mable Martin Hinshaw. Engagement of Karen Sue Hinshaw & Henry Clay Shepherd, Jr.; "The Daily Times News" (Burlington, North Carolina), Apr 15 1970; http://www.ancestry.com.